Get a quote on our pole sheds featuring 29 ga Galvalume siding and roofing (22 colors available too) with top quality components, easy to use building plans, and free technical support as you need help constructing your structure. To get the best price for this type of building don't include overhang and build with 29 ga Galvalume metal siding and roofing. Our Galvalume is a gray color is coated with acrylic and includes the same 40 year paint warranty offered for painted steel siding and roofing. 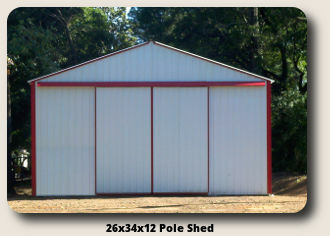 Metal pole sheds have many uses but permanent storage is the most common duty they provide. Trusses can be designed at post spacing up to 9' apart with purlins on edge, or 4'-5' apart with purlins laying flat. They are easy to build, withstand the forces of mother nature, and provide that permanent building you need to protect your equipment or other possessions. A pole shed can incorporate wood siding and a shingle roof instead of metal. The choice is yours. Metal is inexpensive and requires no maintenance but wood isn't much more if that is your preference. Large or small one of our shed kits will provide the best value for a no frills storage building. Include a porch or side shed on your building for additional functionality and more useable space a low cost.